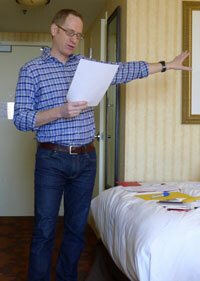 Jim gives preparation tips and tricks when giving a core conversation speech at SXSW, or at your next meeting. I made $1,200 within the first 10 minutes of being an entrepreneur. How did I do that? Well, it wasn’t through marketing or selling a product or closing a deal. On November 1, 2011 I was called into a director’s office and was told my position had been eliminated. Although I was a bit shocked at the sudden layoff, I was actually pretty thrilled at the prospect of starting my own business. I walked back to my desk, checked my personal email, and sitting in my inbox was an invitation to speak at SXSW 2012. I still wanted to go to the conference, but obviously my company – now my former company – wasn’t going to pay for it. What this meant is that as a speaker chosen from more than 3,200 applicants, I would receive a free gold-level conference pass. Value? About $1,200. My freelance career was off to a good start. There are a few different types of programming sessions at SXSW, such as solo keynote speeches and panels. This first year was a 20 minute reading around my book Salary Tutor, followed by a book signing. 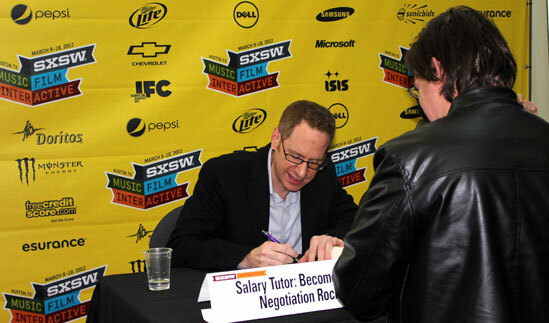 Rather than read from the book, I did a presentation called How to be a Salary Negotiation Rock Star. – I had honed the material for the past year in other speeches. – I put this particular presentation together weeks in advance. – I knew my opening, I knew my jokes, I practiced it over and over again until it was smooth as butter and timing out at 19:45 seconds. – If I may be so bold, I rocked it. Exactly to plan. From sxsw.com… The informal discussions that pop up in the hallways between, during and after panel sessions have traditionally been one of the most productive parts of the SXSW Interactive Festival. In 2008, we formalized this process with the Core Conversation program which has quickly become one of the more popular aspects of the event. In these less formal hour-long sessions a single moderator will introduce the topic to be discussed and then facilitate the conversation. In many ways, a core conversation is similar to any meeting that you need to run at the office. It’s not always presenting findings from the latest marketing plan… sometimes you need to discuss a project with many decision makers, make sure everyone is clear on the goals, has their input, and get everyone on the same page. While I was just slightly nervous when doing my book reading, I knew that I could overcome any anxiety through preparation, and you can too. Practicing a major speech in front of a friend or spouse, or even videotaping it, can give you insights that you can change before you go live. You’re in control. You know your slides, you know the jokes, you know the timing. Presenting in front of a large audience is terrifying for many people, but at least you can prepare. This is not something you can do with a core conversation, and it freaked me out a bit. But I love the saying, do something every day that scares you. Or if you’re a little bit scared about doing something, that’s a good thing. So here is what I did. Let me walk you through the general structure that I used, which can be adapted to any meeting. First, I read up on exactly what was expected from the SXSW website, to get that clear. 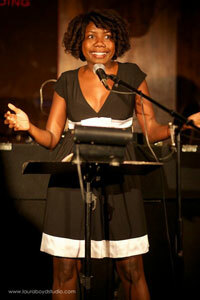 Then I went called my friend Twanna Hines from Funky Brown Chick, a SXSW veteran who has led many panels. “It’s not about you. Don’t make it about you, make it about them. Your goal is to get them talking, not teach them. Because to be honest, the people in that audience know more than you do. Don’t be afraid to call on people in the audience. And remember, it’s not about you.” Thanks Twanna. The next thing I did was start researching. 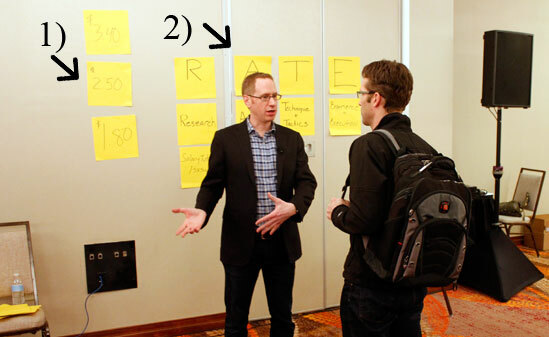 There wasn’t a lot of data (which is why I’m giving back by writing this), but I did come across this great blog post by Gene Kim, How I Prepared For Moderating My SxSW Core Conversation. He narrowed it down to rehearsal, preparation, and process. 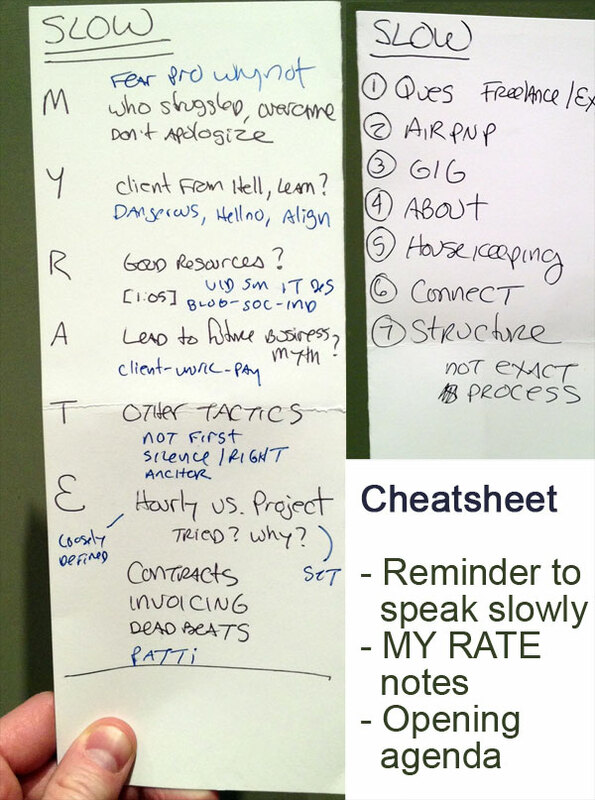 The key thing I really got from it, was to chunk out different topics into smaller increments (his were 6 minutes), and use a quick-reference sheet to keep organized. I started out with a huge, high energy welcome, and asked them a for a show of hands on a question, gauging whether they were newbies just learning about the topic, or experts looking for a few extra key tips. This will help you guide the level of your discussion. I started the conversation with facts: We are all living in a gig economy. According to the Bureau of Labor Statistics, by 2020, 40% of the workforce – 65 million people – will be freelance or temp workers. This set a serious context for what we were talking about… we are all freelancers in some way, and knowing what to charge is crucial. 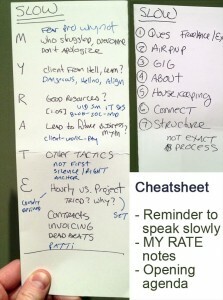 It also gives the note-takers something to jot down, and is very tweetable. The great part about that joke is that it is so bad, that it catches people off guard and they laugh before they can groan. While I knew the session wasn’t all about me, it IS important to give context around who you are, what you do, and why you’re qualified to lead this session. I practiced my opening bio several times to make sure it was succinct without being boastful or going on too long. People want to know who you are. Before I could finish my sentence, the room erupted into conversation, as everyone turned to their neighbor and started chatting. This really brought up the energy in the room, and get people excited. This is a must-do. I thought about the best way to be a leader but not a speaker, and that was coming up with a structure around the conversation. This played in perfectly to the layout I’ve been working on for freelance negotiation. This allowed me to frame the conversation along the way and keep things flowing. I didn’t have a hard in and out on timing, but was always aware to move ahead after 5 minutes or so. Sometimes people brought up issues that I allocated for later (ie, a tactic while we were still on mindset) and I said we’d get back to them, other times I just let it flow. What this also did was let me create a notecard like Gene recommended to keep my pace and have some talking points. I have to say, the people in attendance were the stars. I could have done all of this, but it was up to them to really speak, and the audience was awesome, with lots of people contributing amazing tips. I thank them. – I comment… thanks… do you have markers? For the average person, this would have been a nightmare. I had planned on putting all the housekeeping info… the Hashtag, my twitter handle, the ABCs on one whiteboard, and the MY RATE acronym on the other. Even if there was a pen, I’d have been frantically writing, looked very unprepared, and started late. Fortunately, I follow Murphy’s Law and completely prepared for the worst. I had picked up some of the new large Post-It notes (see point #2 in photo above) they were giving away at the trade show (Thanks 3M!). I brought my own pens and markers, and while they were scurrying for the whiteboard, I assume they would not arrive and used the Post-Its to great success. Always, always, always have a backup plan. After 30-40 minutes of the same routine… going to the next letter, asking questions, calling on people in the audience, people tend to drift off and start checking their phones. There is a lull for sure. I combated that by busting out a case study about beer ¾ of the way through the presentation (see point #1 in photo above). This broke up the monotony of what was happening, brought things back to me for a moment, had a specific, actionable learning takeaway, and even had a few jokes mixed in. If you’ve been selected to lead a core conversation at SXSW, congrats and welcome. However, I think it’s easy to translate these goals to any business situation where you need to lead your peers. 10) Be prepared. Be incredibly over-prepared for the worst case scenario. It’s almost April. It’s tax season. Who LOVES doing taxes? Well, I just got my tax return back from my accountant, and while it was pretty complicated, he didn’t have a single question because I tracked all my income and expenses in Freshbooks. This entry was posted on Friday, March 29th, 2013 at 11:59 pm and is filed under Branding / Advertising, Marketing Case Studies, Reboot Nation/Workshop/Conference, Social Networking / New Media, Workplace Trends. You can follow any responses to this entry through the RSS 2.0 feed. Both comments and pings are currently closed.